& That all were already finished off within 5 day time period !! ??? Why not they be ( ??) as they were so yum & healthy , I can’t Even Control my Sweet Cravings With these Healthy bars now ,, come on ?? So Finally I Comes Up With My Honest Reviews For The Same !! The Brand Manufacturers Two more flavours too & That are Cool Mint & Bambaiya chat !! I make sure it’s really hard to choose amongst all !! The Brand Eat Anytime Manufacturers healthy –wholesome choice health bars for snacking wise ..
After all , Health is the wealth they promise every time we E.A.T. !! It’s A Mumbai Based brand started By a Beautiful Couple & their friend keeping in mind that how people often forget to skip their breakfast or skip Healthy meals into this fast struggling life !! 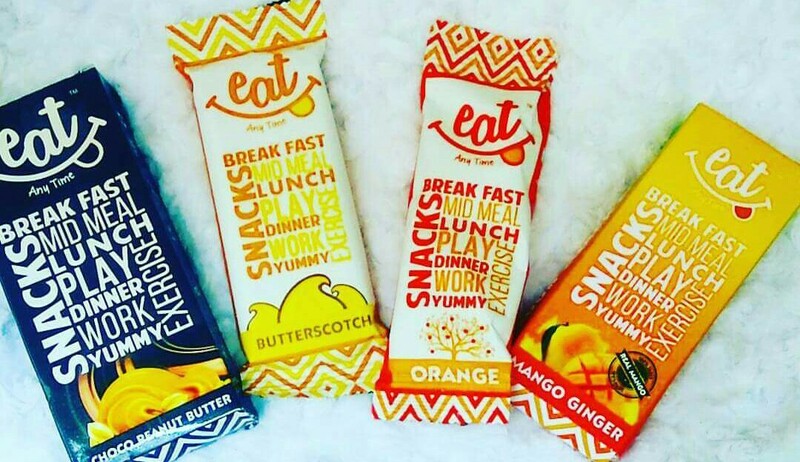 EAT Anytime healthy snacks and nutrition bars are made from natural ingredients likes nuts, oats, seeds, dates which provides a balanced meal on the go which is now available in 6 flavours mentioned above !! Each bar is full of energy to keep you active and attentive throughout your day and helps reduce weight to keep you fit. Grab your bite and start living a more productive life. It’s like a treasure they decided to share it with all. Thus evolved Eat Any Time (E.A.T.) BARS, so that health was available for all, at all times to simply by E.A.Ting! How Beautiful this butterscotch bar is looking in my hands ???? Comes In A Very Beautiful Outer carton Pack Weighs 40 gms each bar Which retails for rs. 50/- each, though it makes a Budget friendly purchase too !! For More Information About these Healthy bars or brand you can visit their Official Site , find the direct link below ⬇⬇⬇ !! Store In A cool, dark place .. Can be stored in plastic containers .. Store open bars in the refrigerator !! I Personally Suggest These Health Bars To all my friends for their all the members of the family say it for themselves , their kids , their spouse or to an elderly person in their families !! It Gives a healthy dose for munching all the time Which equally Tastes Delicious !! After All A “Healthy Nutrition Is Equals to Healthy Living ” !! So Whether I Repurchase it or not ??? Yes yes definitely , I already Ordered a big Pack of 12 for My Family as we Loved Them alot & will recommend this to everyone !! Would love to try their more flavours too ..
.A Big thumbs up for the Brand from myside ?? #eatanytime #EATANYTIME #healthysnacks #healthyliving #healthybars #cantwaittotry #sundayfun #mail #mailboxpeak #mailalert #inmymailtoday #instagramers #nomnom #instalike #INSTAPOST #healthybreakfast #healthyfood #sundayfunday #sweetsunshineblog #sunshinemail #sunshinemailalert #instagood #instafun #instayay #prfriendly #ProductReview #munchingallthetime !! Choco peanut butter sounds like a great combination. Will try it out for sure. Yummy munching ???? taste aise describe kiya hai ki muh me paani aa gaya ? I especially loved the Butterscotch one! They are good for sure!